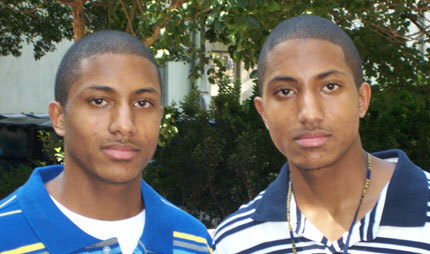 Atlanta's Harlow twins join Emory College's freshman class. During their years at North Atlanta High School, identical twins Howard Jason Harlow 10C and Howard Justin Harlow 10C were dual achievers—cocaptains of the varsity baseball and basketball teams, runners on the cross-country track team, and heavily involved in student government, while maintaining impressive grade point averages in the International Baccalaureate program and volunteering to speak at local middle schools about peer pressure. Emory had long been Jason’s first choice for college. The twins’ sister, Tiffany Harlow 01C, graduated from Emory with a degree in political science before going on to law school. Justin wasn’t convinced until he spent time on campus. “What finally swayed me was when I came to a recruitment weekend, Essence of Emory, and met a lot of people I realized I could spend the next four years with—I even found my roommate there,” says Justin, who, like his brother, has been named a Martin Luther King Jr. Scholar. From a record 14,232 applications (up 18.5 percent from last year,) the College admitted its most selective class in history—less than a third of those who applied were accepted. Still, it’s a large group: 1,340 first-year students. “Nearly one in twelve is international, which is an all-time high—there are 107 international first-year students in all,” says Jean Jordan, interim dean of admission. Kwon speaks Korean, English, and Spanish, and is interested in studying Japanese and Chinese at Emory as well. “I like being able to speak to people in other languages," she says. “I think I'm aiming toward a degree in international business right now.”—M.J.L.